Home / 'Eyes without Sparkle - a journey through postnatal illness' / My message to Adele and her friend Laura Dockrill – life beyond perinatal mental illness. Alternatively, we can applaud them for highlighting certain illnesses and raising awareness. This week it is actually the best friend, Laura Dockrill, of internationally acclaimed singer Adele, who has been featured across the media, due to her illness puerperal (postpartum) psychosis. It is this connection that provided this story with wings and enabled it to take flight. This is very powerful because as ‘a friend’ she can be perceived as being ‘normal’. Thank you to both of them for doing this – and the media interest as a result. There have been many articles about it and it has been great to see some of my contacts expressing their thoughts and opinions as well e.g. on BBC Breakfast (Giles Berrisford); Channel 5 news (Eve Canavan) and Radio 5Live (Kathyrn Grant). I am sure that many more people will now be aware of this illness and the help available…or not, depending on where you live. 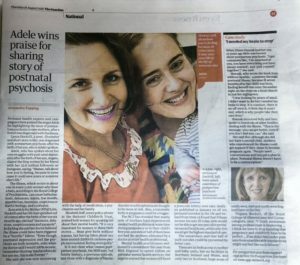 I was very pleased to be called by The Guardian newspaper yesterday and am featured next to Adele and her friend Laura Dockrill, on page 21 today. The online article can be read here. 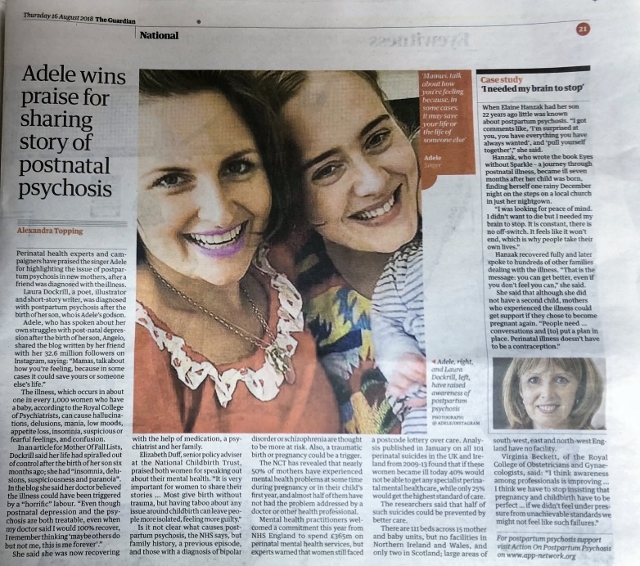 I am so pleased that the journalist, Alexandra Topping, listed the charity that I mentioned to her where mothers can get support with postpartum psychosis – Action on Postpartum Psychosis . It is great that more people will now be aware of this devastating illness. When I read the blog article where the story was first aired, https://motherofalllists.com/2018/08/13/postpartum-psychosis/ , I felt saddened, as I always do, that another mother had suffered the same illness I did. Adele also has spoken out about her struggle with postnatal illness (not psychosis) after her son was born. Both of them now seem determined never to have another baby. Firstly, let me say that this decision is none of my business – or anyone else’s for that matter! Our society does have a habit of commenting on the size and gender within other people’s families – if you have lots of children, you are judged. If you have more than one of the same gender, a possible reaction of ‘you must be so disappointed not to have had boy/girl’. If you have one child there can be comments such as ‘when are they having a baby brother/sister’ – or ‘after what you went through last time, you must be crazy to have another’. It is YOUR decision and the rest of us should keep our mouths closed and support the child/children we are blessed with. Secondly, I can appreciate why neither of them want to go through the agonies of perinatal mental illness again. It truly is horrible, and it is not to be wished it on anybody! I know…because my family and I went through it. That said, I want to share what a lady commented to me who also had been very unwell after her first baby. She went on to have a second baby some years after her first, having made a plan for optimal health and practical arrangements. This involved her health professionals along with family and friends. She remained mentally well after having her next baby. She pleaded with me to let other families know that there are steps that can be taken ‘next time round’. Her message to me was ‘don’t let women reach the menopause – and beyond, living with the regret that they didn’t dare risk another pregnancy’. This is my message to Adele, Laura and all those who have experienced a tough time with a pregnancy, birth and/or postnatal period. Having written about my experiences in my book ‘Eyes without Sparkle, a journey through postnatal illness’ (2005), I continued to speak out and learn about the conditions. So often people would ask me what to do ‘next time round’ or if they became unexpectedly pregnant. I collected information from around 100 families and along with the knowledge and resources I had gained over the years, wrote my second book – ‘Another Twinkle in the Eye – contemplating another pregnancy after a perinatal mental illness’ (2016). It was highly commended by the British Medical Association for ‘outstanding contribution to medical literature’. The aim of my book was to inform families about the possible conversations to have; choices and plans to be made with the ultimate aim for them to be at peace with whatever decision they come to, the decision that is right for them. It might not happen again, I’ve met people who it didn’t happen to next time around, but if it does you have the huge advantage that you have wrestled with this beast before and come out the other side. You know you are not actually going mad, that you will one day feel ‘okay’ again and that this is an illness and you will recover. This puts you at a huge advantage compared to people who suddenly find themselves in this strange land with no idea where they are or how to get back ‘home’. Not only is postpartum psychosis a risk, but you might find it hard to cope all the way until the child is five and more independent. Just wait to have children. Take your time. Everything changes after a baby and there’s no going back. You have to be sure of your motivation to want another baby, and honest with yourself. Is it just to assuage history and put the past right? I feel very strongly that as per my GP’s advice, you have to consider the impact and views of the entire family – partner, other children. Don’t be put off from considering more children if you’ve always wanted a bigger family. You could feel more guilt and disappointment in the long run if you let the illness stop you, and there’s a chance you could become unwell again even if you don’t have another child. If you have unresolved issues about your illness seek counselling to talk these over and help you decide what’s best for you regarding future children. I would recommend that any prospective 2nd time parents have full and frank discussions about coping and MH before conceiving another child. We did this and when we conceived our second my husband had a good idea of how things might go wrong, and I had a good idea of how I would recognise the signs and support myself and enable him to support me. I also prepared trusted friends and family, gave out lists of numbers and names who to contact if they had concerns. I found it extremely helpful and reassuring and I know my husband was infinitely more aware – and much more confident. I strongly feel that the result of all this prep (which, in all, took a year to finalise), was that my second time was so much calmer and more reassured than the first. Although I have suffered this awful cruel illness twice and been to the darkest depths of despair, my children and partner are the light of my life and the year I suffered following their births is nothing compared to the life of happiness these children give me every day. I adore them and feel a stronger person than ever. I wish Laura a complete recovery (although the experience does change you – as the lady above acknowledges) and years of happiness with her family and her best friend. Please be assured that you will find delight in life again. Now is not the time for you to be considering another baby. And Adele, you are further on in your journey – may I send you a copy of my book? I make no apology for ‘using’ this story to shout out about my books. This is because I have been told many times that they help, both families and the health professionals! My first one has helped to save lives and gives hope. It helps to know that you are not alone and that you will get better. I am told that my second provides the information to live a life free from regret about having another baby – or it has helped to bring new life into this world, minimising the mental health risks of the mother. Family means most to me in life – I simply want to help others get the best from theirs.